Would your sleep be as good in a lift chair as it is in a bed? Are you interested in using a lift chair for sleeping? This article discusses how to choose the right lift chair sleeper to sleep in, how comfortable lift chair recliners are as beds, and what reviewers said about sleeping in their lift chair. Two position: these lift chairs can move into the upright position as well as a 15 degree recline. The footrest can not be moved independently from the back. There is only one motor. Three position: these lift chairs can move into the upright position, 15 degree recline, and 45 degree recline. The footrest can not be moved independently from the back. There is only one motor. Infinite position: these lift chairs can move into any position mentioned above as well as a flat recline and the Trendelenburg position, where the heart is below the feet. The footrest can move independently from the back as there are two motors, one for the ottoman and one for the back. Zero gravity: these are a type of infinite position lift chairs that can go into the “zero gravity” position. This was a position found by NASA that reduced stress on the body. 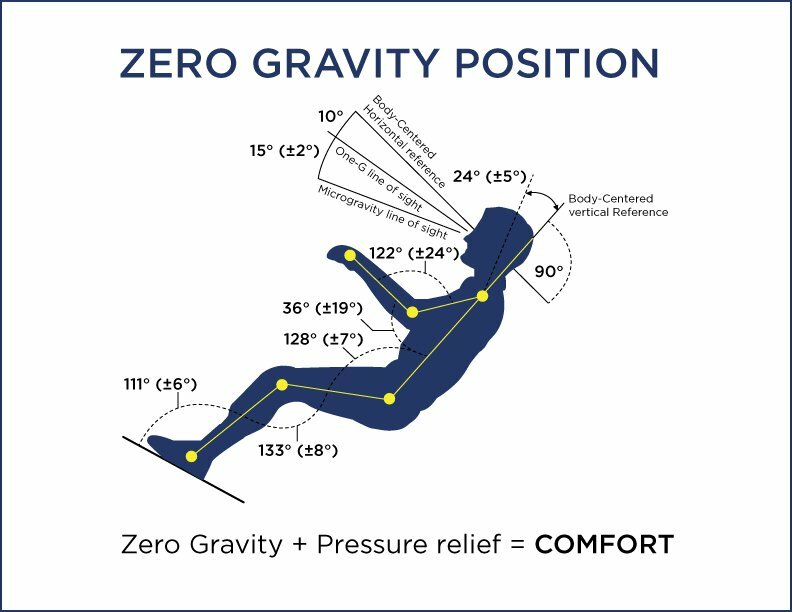 Sleeping in the Zero Gravity position reduces pressure on the body which means it can be better than a traditional bed. For the above reasons, one would want to buy an infinite position lift chair or a zero gravity lift chair to sleep in. Sleeping at a 15 degree or 45 degree recline is uncomfortable. For infinite position and zero gravity lift chairs, which allow for unlimited configurations, one can adjust them until they find a comfortable setting for sleeping. After you’ve found the right type of lift chair, the next step is to make sure the lift chair fits your size. The seat needs to be wide enough to fit you comfortably. Your knee needs to be at 90 degree when sitting with your feet touching the floor. Your back needs to be on the back. If your back does not reach the back, find a lift chair with a shorter front to back distance. If your knee is not at 90 degrees, find longer or shorter lift chair. Lift chairs can come in petite, medium, large, and extra large models. Simply choose a larger or smaller model to get the right fit. Also, make sure that your weight is within the maximum weight limit for the chair. If not, buy one that has a weight limit high enough for you. If you choose a leather lift chair, make sure you get a soft leather to sleep in. All quality lift chairs are built for extended use. They planned the chair for individuals who will be spending the majority of the day eating, watching TV, reading, working, and writing on the chairs. Because of that, quality lift chairs have a sturdy wood frame, comfortable seats (some even have coils like automobile seats), and thick cushions. Beyond this, the rest is individual preference. Avoiding cheap, low quality sleep chairs will ensure you have adequate rest when sleeping in your lift chair. One daughter said that her grandmother slept comfortable in the chair and used it daily. It pleased her to see her grandmother be mobile and independent. A reviewer said he slept well in the chair. He viewed it as a fault as it was too easy to fall asleep. Another reviewer said she enjoys her lift chair more than her bed. If you are looking to buy a lift chair as a bed, make sure you buy a quality infinite position or zero gravity lift chair. With that satisfied, you are free to pick any chair that meets your taste, budget, and preference. Lift chairs come in a wide variety of colors, upholstery, designs, and models. Have fun shopping! I am considering a quality lift chair as I have problems pulling my feet onto a mattress. Can one roll from side to side on these chairs. Obviously I would not sleep on my stomach. I have looked at adjustable beds but to accommodate a lowered foot on the bed then the bed would be too low to haul myself up to stand. Can a quality chair take the place of a bed? Can a quality chair replace a bed?